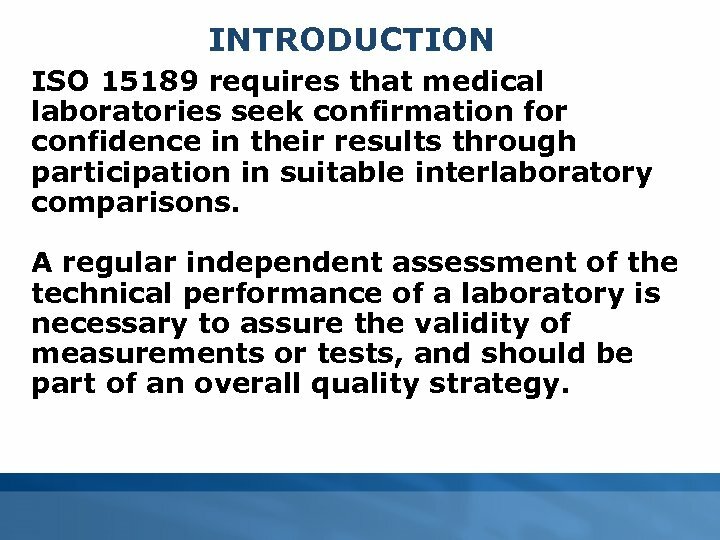 INTRODUCTION ISO 15189 requires that medical laboratories seek confirmation for confidence in their results through participation in suitable interlaboratory comparisons. A regular independent assessment of the technical performance of a laboratory is necessary to assure the validity of measurements or tests, and should be part of an overall quality strategy. 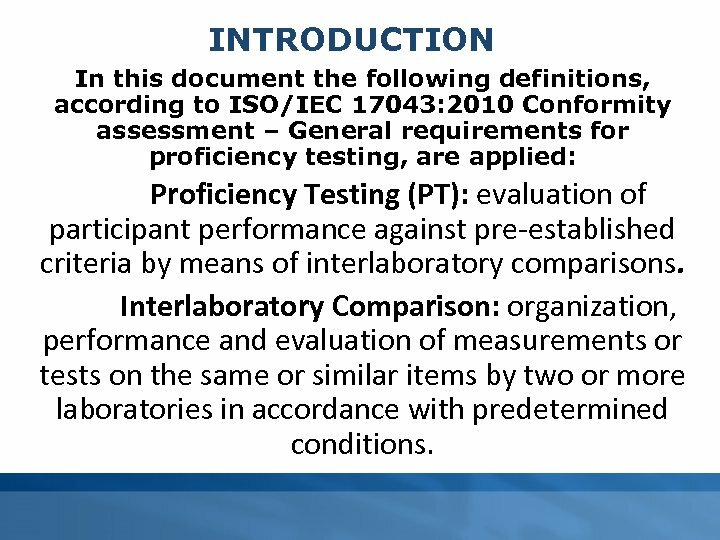 INTRODUCTION In this document the following definitions, according to ISO/IEC 17043: 2010 Conformity assessment – General requirements for proficiency testing, are applied: Proficiency Testing (PT): evaluation of participant performance against pre-established criteria by means of interlaboratory comparisons. Interlaboratory Comparison: organization, performance and evaluation of measurements or tests on the same or similar items by two or more laboratories in accordance with predetermined conditions. INTRODUCTION One of the elements by which accredited laboratories can demonstrate technical competence is by satisfactory participation in Proficiency Testing (PT) activities where such activities are available and appropriate. 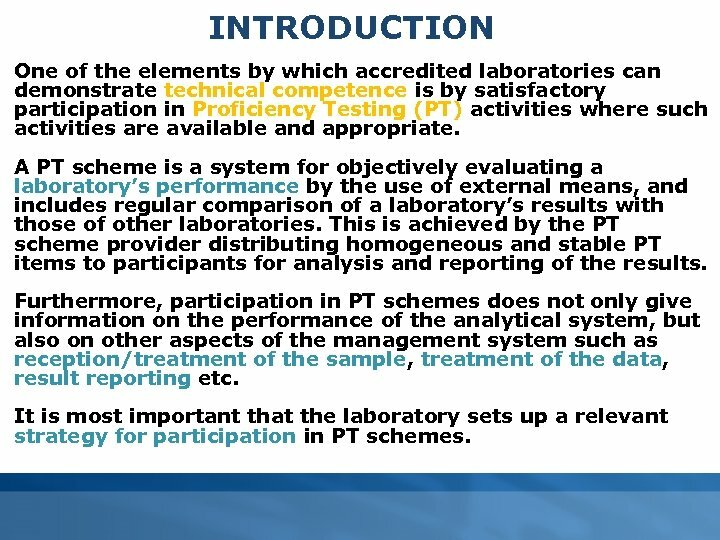 A PT scheme is a system for objectively evaluating a laboratory’s performance by the use of external means, and includes regular comparison of a laboratory’s results with those of other laboratories. This is achieved by the PT scheme provider distributing homogeneous and stable PT items to participants for analysis and reporting of the results. Furthermore, participation in PT schemes does not only give information on the performance of the analytical system, but also on other aspects of the management system such as reception/treatment of the sample, treatment of the data, result reporting etc. 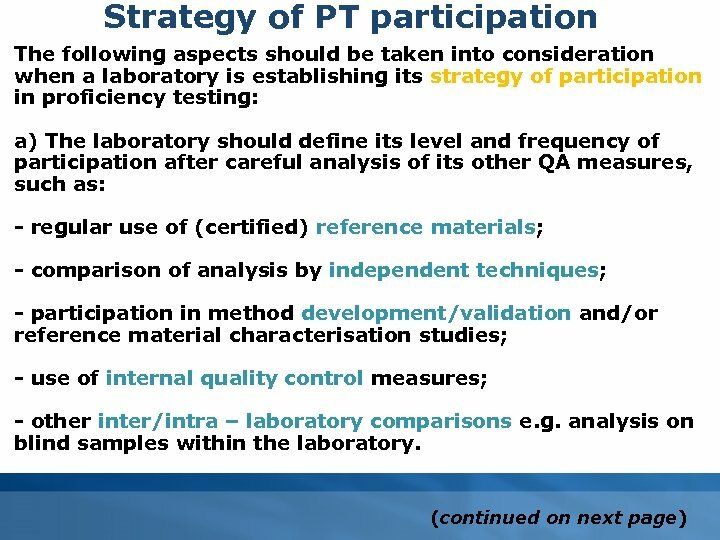 It is most important that the laboratory sets up a relevant strategy for participation in PT schemes. 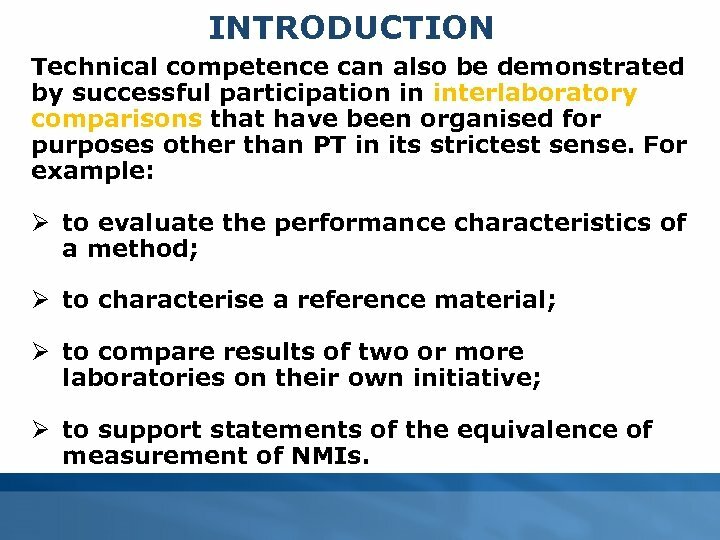 INTRODUCTION Technical competence can also be demonstrated by successful participation in interlaboratory comparisons that have been organised for purposes other than PT in its strictest sense. For example: Ø to evaluate the performance characteristics of a method; Ø to characterise a reference material; Ø to compare results of two or more laboratories on their own initiative; Ø to support statements of the equivalence of measurement of NMIs. 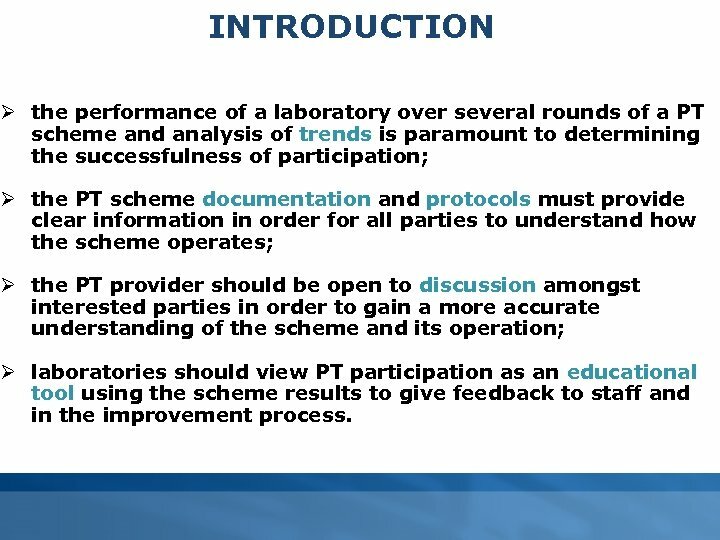 INTRODUCTION Ø the performance of a laboratory over several rounds of a PT scheme and analysis of trends is paramount to determining the successfulness of participation; Ø the PT scheme documentation and protocols must provide clear information in order for all parties to understand how the scheme operates; Ø the PT provider should be open to discussion amongst interested parties in order to gain a more accurate understanding of the scheme and its operation; Ø laboratories should view PT participation as an educational tool using the scheme results to give feedback to staff and in the improvement process. 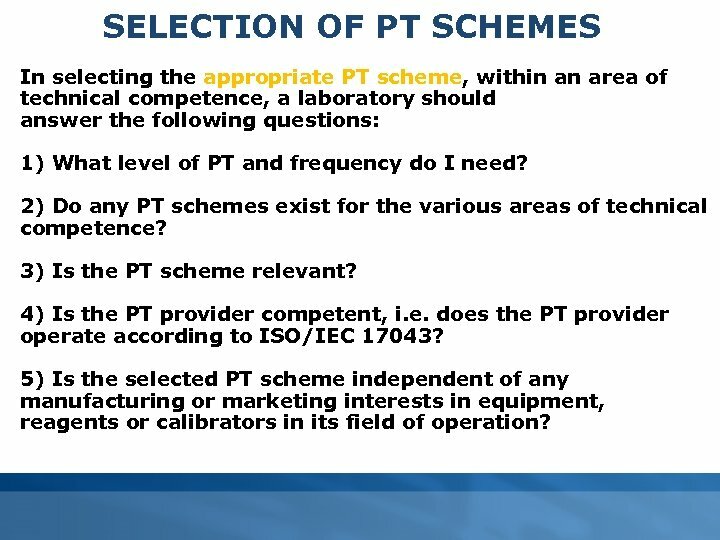 SELECTION OF PT SCHEMES In selecting the appropriate PT scheme, within an area of technical competence, a laboratory should answer the following questions: 1) What level of PT and frequency do I need? 2) Do any PT schemes exist for the various areas of technical competence? 3) Is the PT scheme relevant? 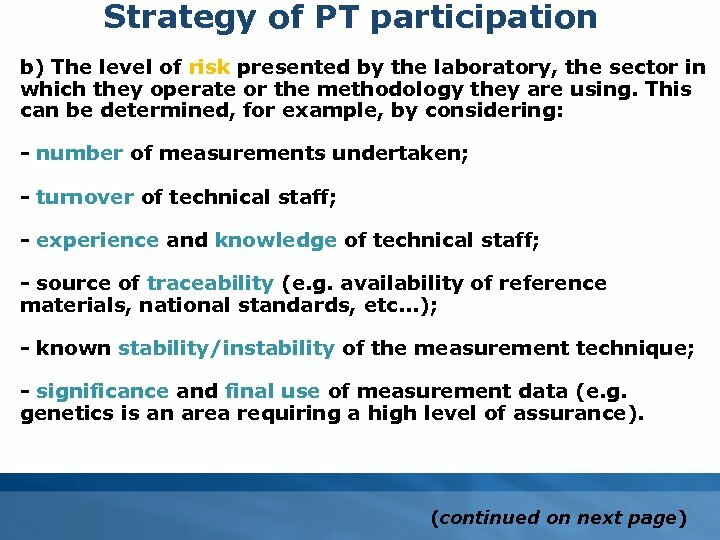 4) Is the PT provider competent, i. e. does the PT provider operate according to ISO/IEC 17043? 5) Is the selected PT scheme independent of any manufacturing or marketing interests in equipment, reagents or calibrators in its field of operation? 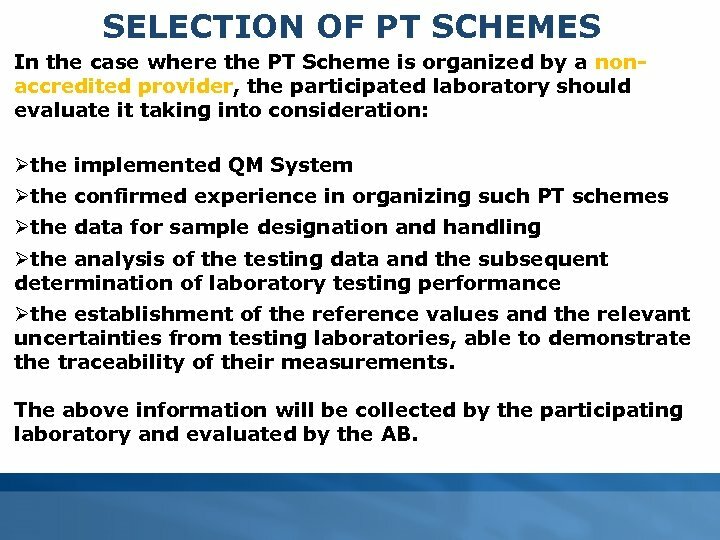 SELECTION OF PT SCHEMES In the case where the PT Scheme is organized by a nonaccredited provider, the participated laboratory should evaluate it taking into consideration: Øthe implemented QM System Øthe confirmed experience in organizing such PT schemes Øthe data for sample designation and handling Øthe analysis of the testing data and the subsequent determination of laboratory testing performance Øthe establishment of the reference values and the relevant uncertainties from testing laboratories, able to demonstrate the traceability of their measurements. 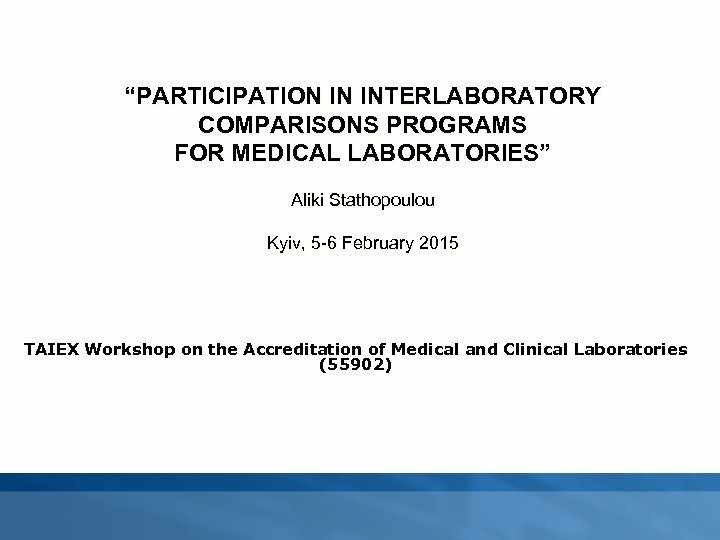 The above information will be collected by the participating laboratory and evaluated by the AB. 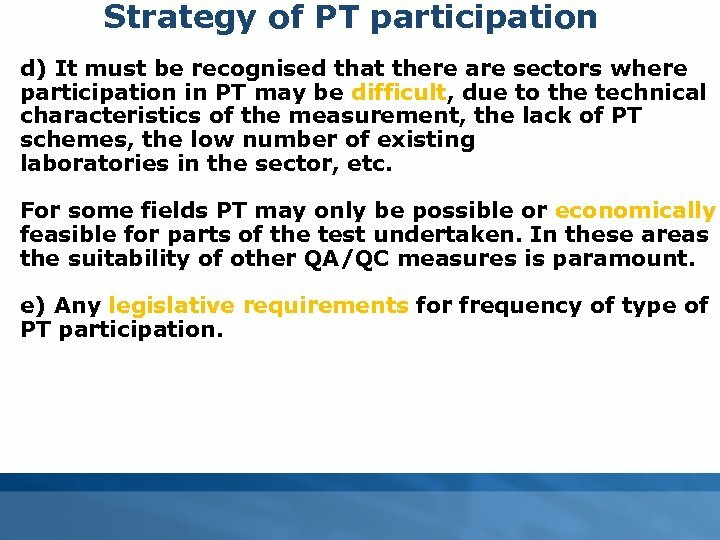 Strategy of PT participation d) It must be recognised that there are sectors where participation in PT may be difficult, due to the technical characteristics of the measurement, the lack of PT schemes, the low number of existing laboratories in the sector, etc. For some fields PT may only be possible or economically feasible for parts of the test undertaken. In these areas the suitability of other QA/QC measures is paramount. e) Any legislative requirements for frequency of type of PT participation. 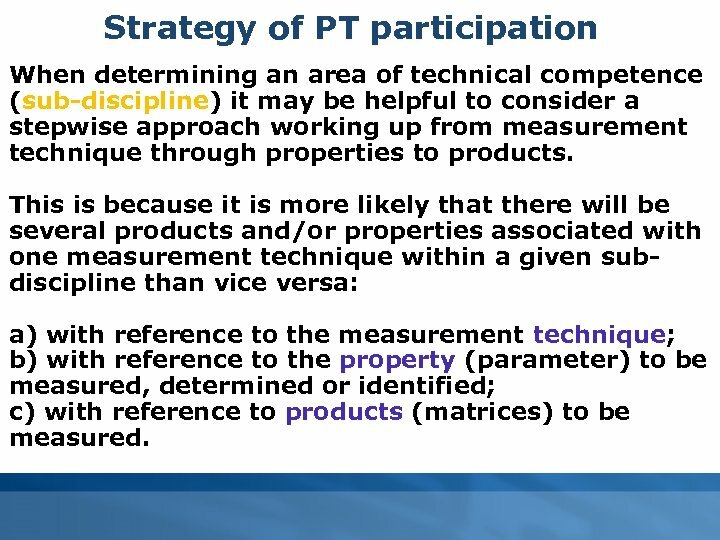 Strategy of PT participation When determining an area of technical competence (sub-discipline) it may be helpful to consider a stepwise approach working up from measurement technique through properties to products. 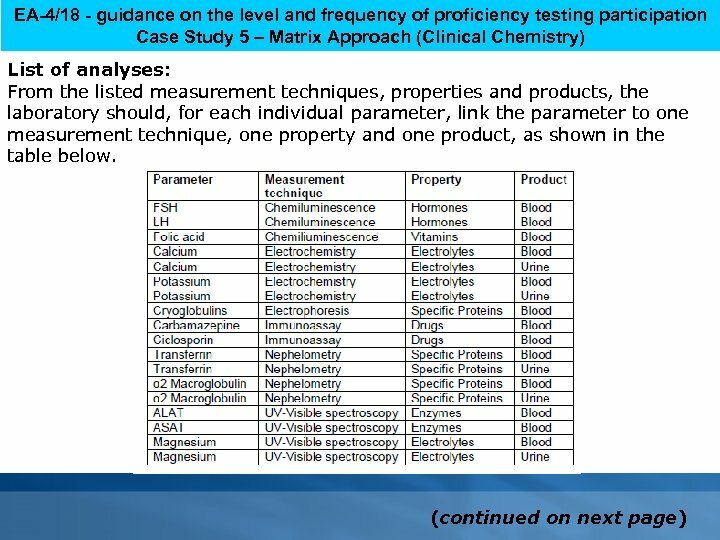 This is because it is more likely that there will be several products and/or properties associated with one measurement technique within a given subdiscipline than vice versa: a) with reference to the measurement technique; b) with reference to the property (parameter) to be measured, determined or identified; c) with reference to products (matrices) to be measured. 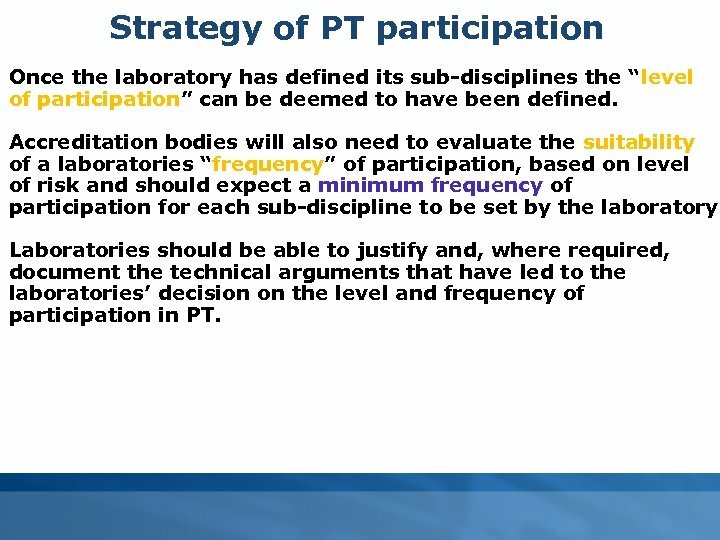 Strategy of PT participation Once the laboratory has defined its sub-disciplines the “level of participation” can be deemed to have been defined. 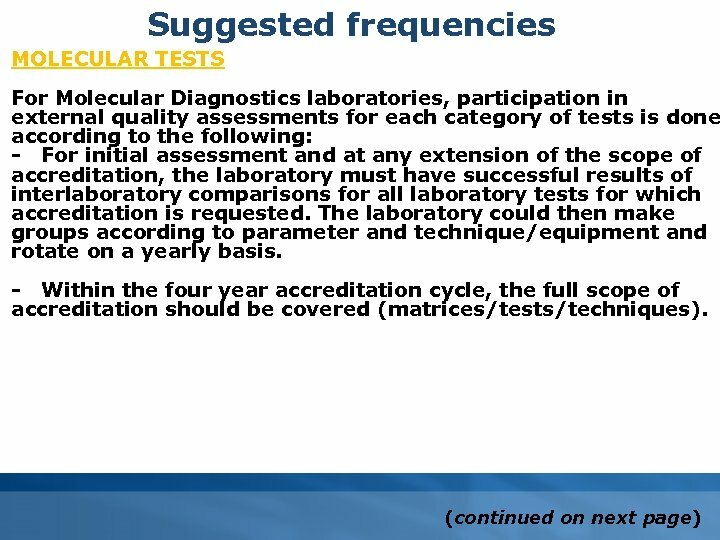 Accreditation bodies will also need to evaluate the suitability of a laboratories “frequency” of participation, based on level of risk and should expect a minimum frequency of participation for each sub-discipline to be set by the laboratory. 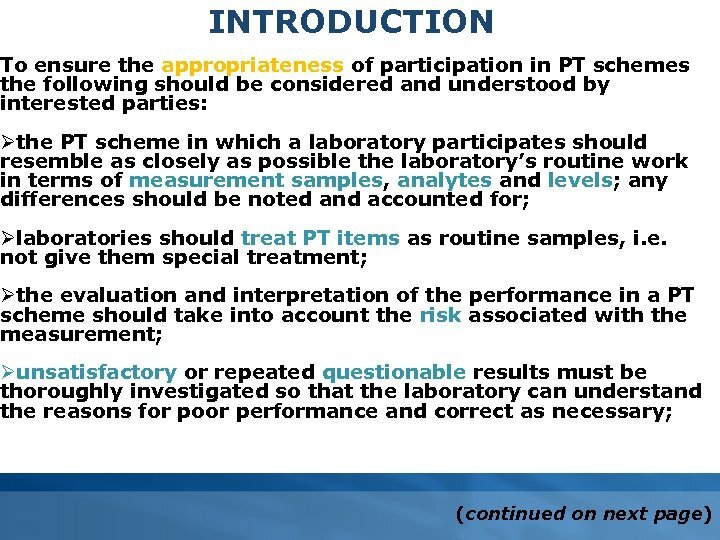 Laboratories should be able to justify and, where required, document the technical arguments that have led to the laboratories’ decision on the level and frequency of participation in PT. 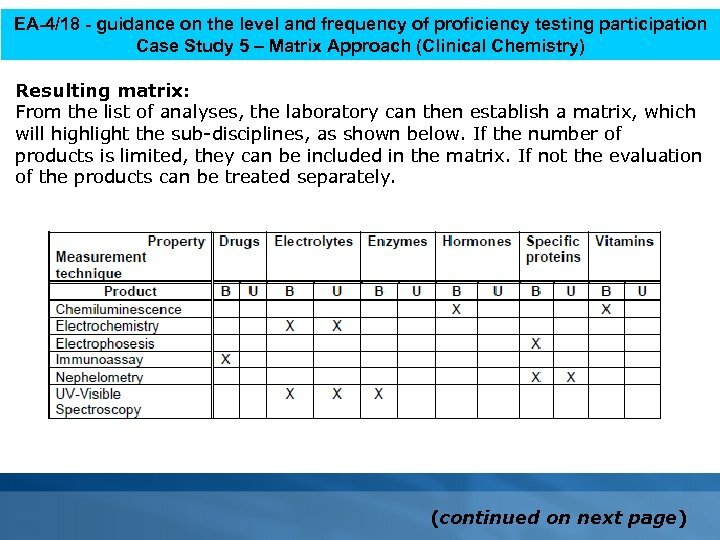 EA-4/18 - guidance on the level and frequency of proficiency testing participation Resulting sub-disciplines from this exercise: Case Study 5 – Matrix Approach (Clinical Chemistry) 1. Hormones by Chemiluminescence in blood 2. Vitamins by Chemiluminescence in blood 3. Electrolytes by Electrochemistry in blood and urine 4. Specific proteins by Electrophoresis in blood 5. Drugs by Immunoassay in blood 6. Specific proteins by Nephelometry in blood and urine 7. Electrolytes by UV-Visible spectroscopy in blood and urine 8. Enzymes by UV-Visible spectroscopy in blood Note: although the different products have been combined into one sub-discipline for each detection system in terms of being equivalent from a competency point of view, this does not suggest that they are equivalent in terms of method and laboratory performance. Therefore, the laboratory would be expected to undertake such PTs specifically covering all the products in their scope on a periodic basis. This would be expected to be clearly detailed in their proficiency testing strategy. 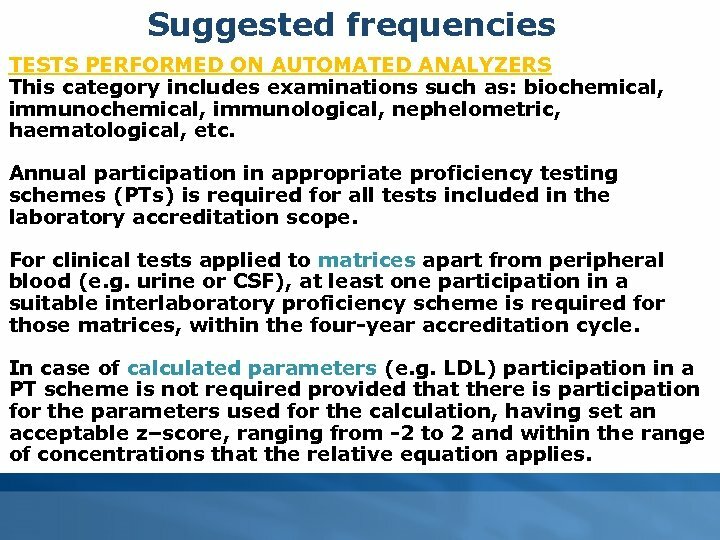 Suggested frequencies TESTS PERFORMED ON AUTOMATED ANALYZERS This category includes examinations such as: biochemical, immunological, nephelometric, haematological, etc. 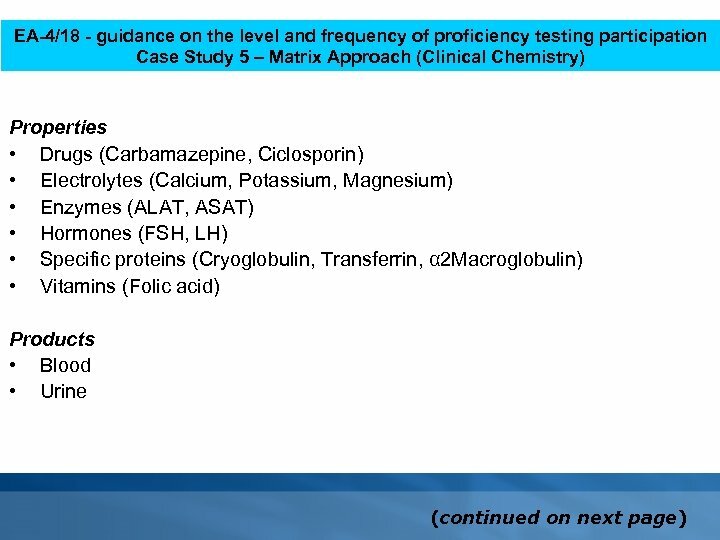 Annual participation in appropriate proficiency testing schemes (PTs) is required for all tests included in the laboratory accreditation scope. 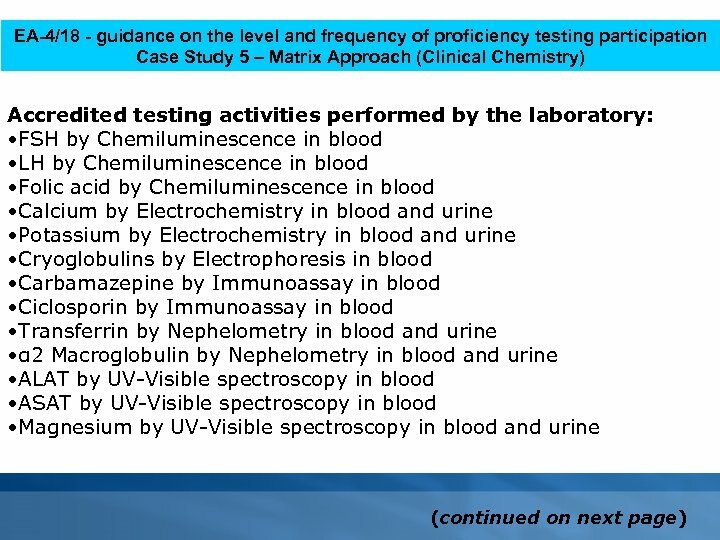 For clinical tests applied to matrices apart from peripheral blood (e. g. urine or CSF), at least one participation in a suitable interlaboratory proficiency scheme is required for those matrices, within the four-year accreditation cycle. In case of calculated parameters (e. g. LDL) participation in a PT scheme is not required provided that there is participation for the parameters used for the calculation, having set an acceptable z–score, ranging from -2 to 2 and within the range of concentrations that the relative equation applies. 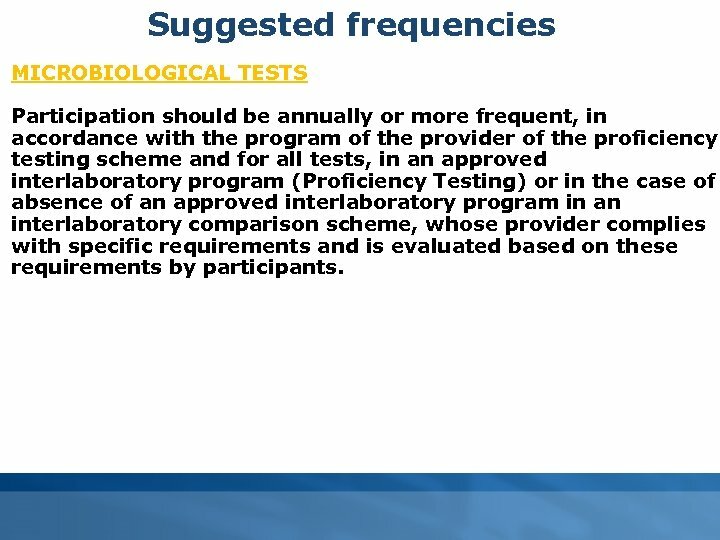 Suggested frequencies MICROBIOLOGICAL TESTS Participation should be annually or more frequent, in accordance with the program of the provider of the proficiency testing scheme and for all tests, in an approved interlaboratory program (Proficiency Testing) or in the case of absence of an approved interlaboratory program in an interlaboratory comparison scheme, whose provider complies with specific requirements and is evaluated based on these requirements by participants. 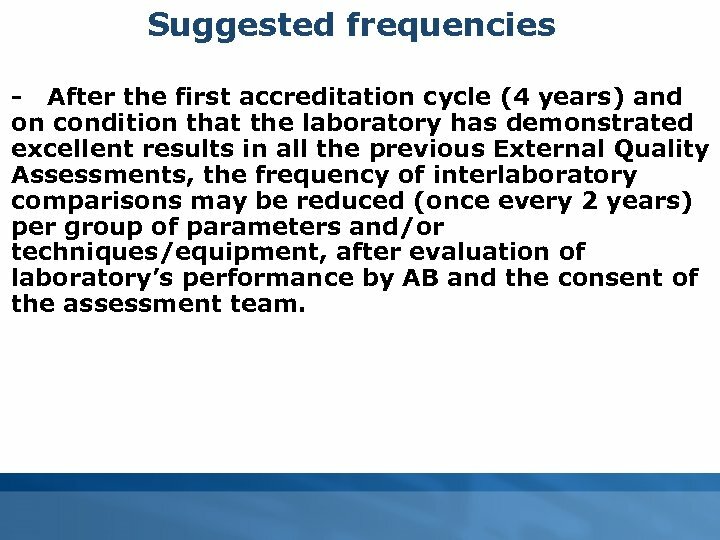 Suggested frequencies - After the first accreditation cycle (4 years) and on condition that the laboratory has demonstrated excellent results in all the previous External Quality Assessments, the frequency of interlaboratory comparisons may be reduced (once every 2 years) per group of parameters and/or techniques/equipment, after evaluation of laboratory’s performance by AB and the consent of the assessment team. 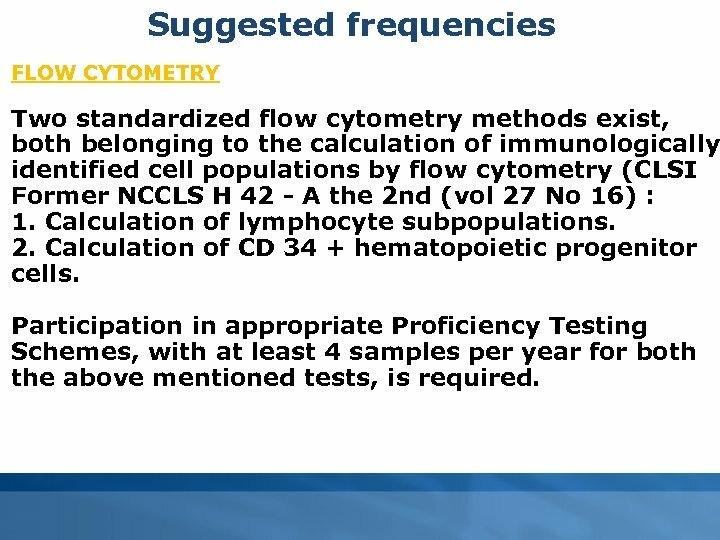 Suggested frequencies FLOW CYTOMETRY Two standardized flow cytometry methods exist, both belonging to the calculation of immunologically identified cell populations by flow cytometry (CLSI Former NCCLS H 42 - A the 2 nd (vol 27 No 16) : 1. Calculation of lymphocyte subpopulations. 2. Calculation of CD 34 + hematopoietic progenitor cells. 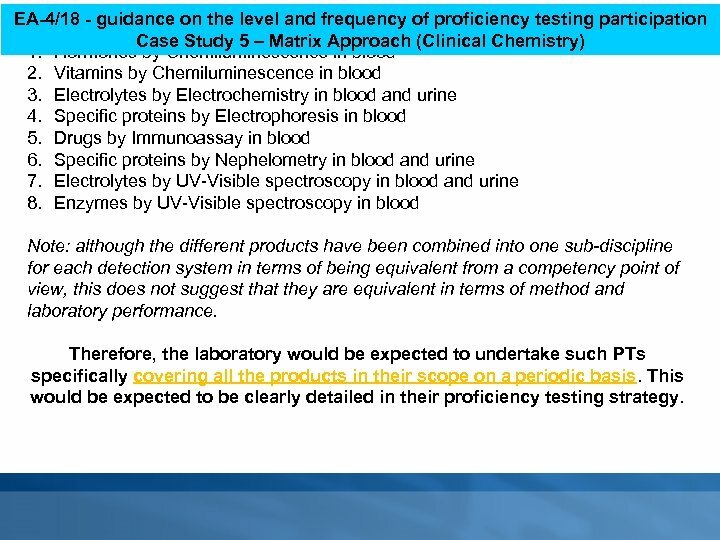 Participation in appropriate Proficiency Testing Schemes, with at least 4 samples per year for both the above mentioned tests, is required. 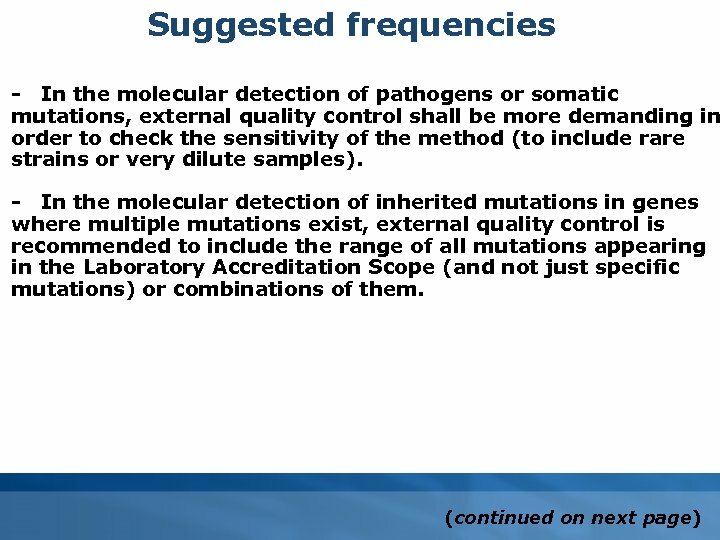 Suggested frequencies MICROSCOPY This category includes microscopical haematological, microbiological, cytological and histopathological tests. 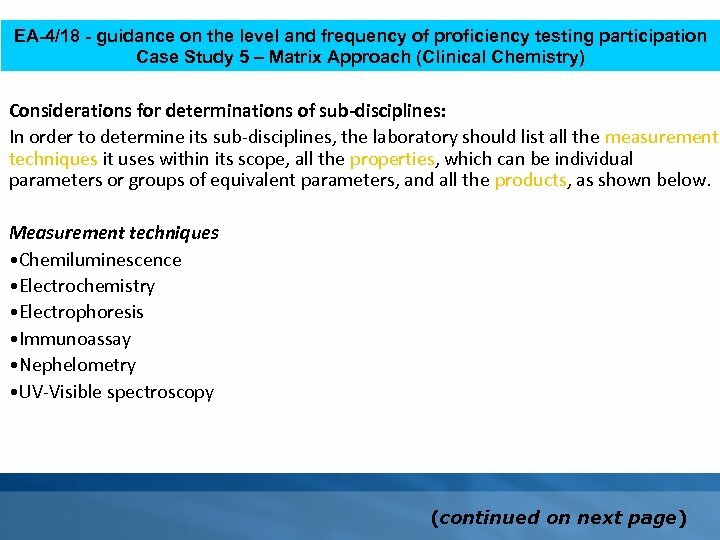 The participation of the Laboratory in proficiency testing programs should be at least annual, ensuring the participation of all members of the Laboratory. 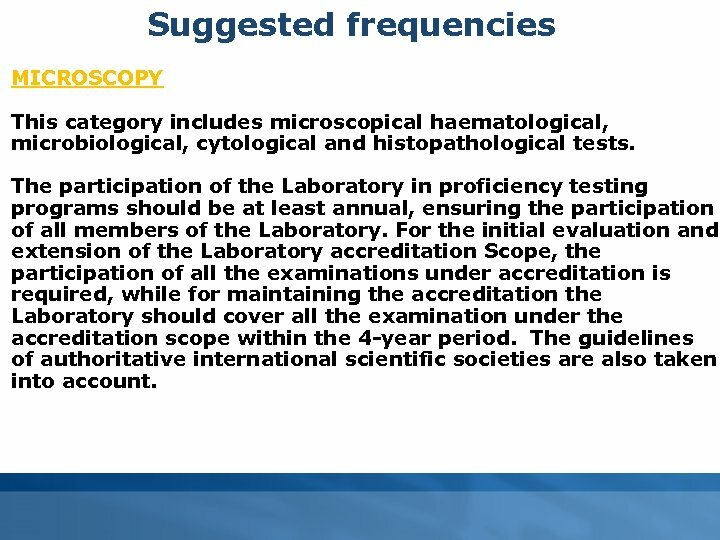 For the initial evaluation and extension of the Laboratory accreditation Scope, the participation of all the examinations under accreditation is required, while for maintaining the accreditation the Laboratory should cover all the examination under the accreditation scope within the 4 -year period. The guidelines of authoritative international scientific societies are also taken into account. 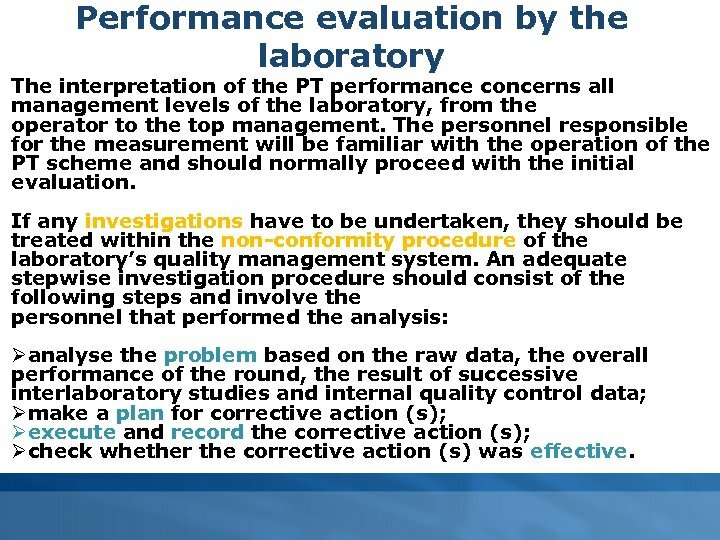 Performance evaluation by the laboratory The interpretation of the PT performance concerns all management levels of the laboratory, from the operator to the top management. The personnel responsible for the measurement will be familiar with the operation of the PT scheme and should normally proceed with the initial evaluation. If any investigations have to be undertaken, they should be treated within the non-conformity procedure of the laboratory’s quality management system. An adequate stepwise investigation procedure should consist of the following steps and involve the personnel that performed the analysis: Øanalyse the problem based on the raw data, the overall performance of the round, the result of successive interlaboratory studies and internal quality control data; Ømake a plan for corrective action (s); Øexecute and record the corrective action (s); Øcheck whether the corrective action (s) was effective. 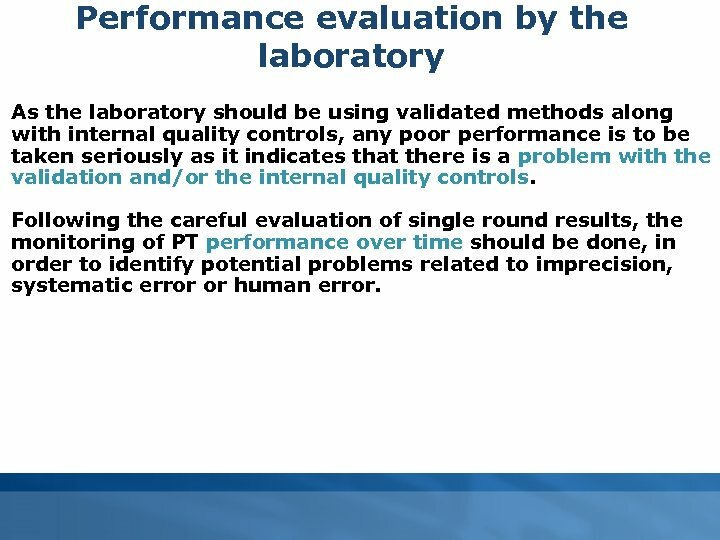 Performance evaluation by the laboratory As the laboratory should be using validated methods along with internal quality controls, any poor performance is to be taken seriously as it indicates that there is a problem with the validation and/or the internal quality controls. Following the careful evaluation of single round results, the monitoring of PT performance over time should be done, in order to identify potential problems related to imprecision, systematic error or human error. 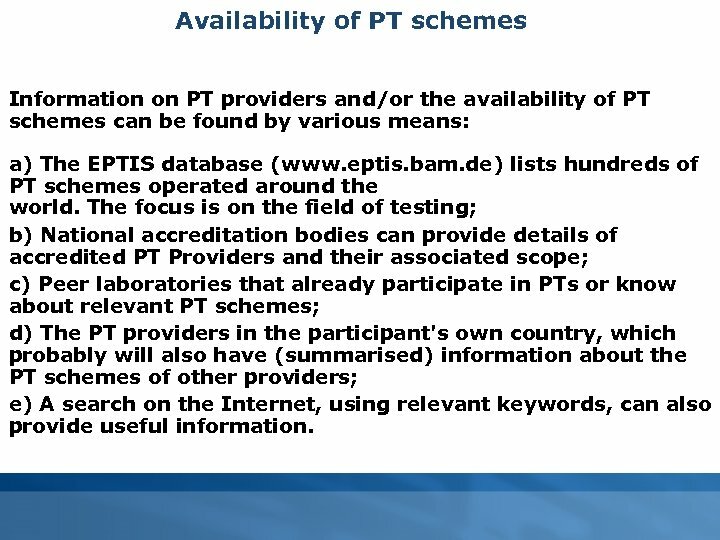 Availability of PT schemes Information on PT providers and/or the availability of PT schemes can be found by various means: a) The EPTIS database (www. eptis. bam. 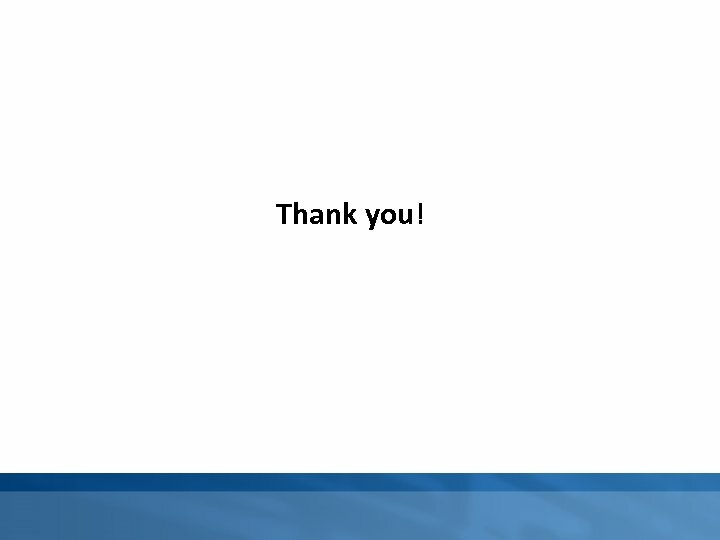 de) lists hundreds of PT schemes operated around the world. 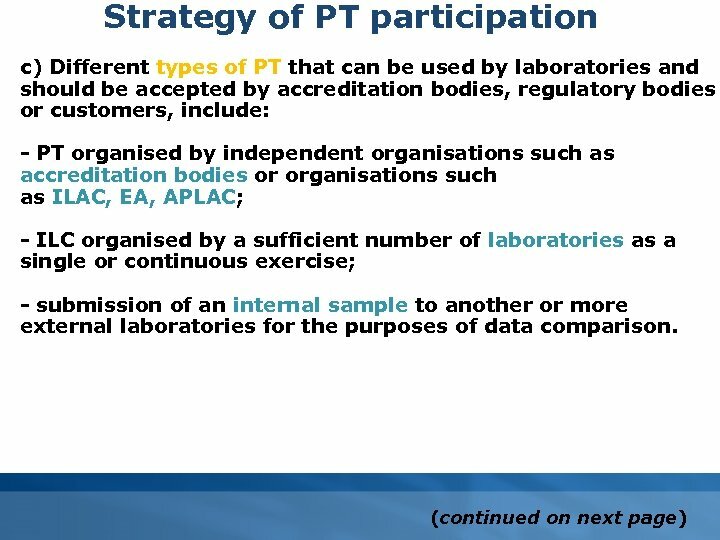 The focus is on the field of testing; b) National accreditation bodies can provide details of accredited PT Providers and their associated scope; c) Peer laboratories that already participate in PTs or know about relevant PT schemes; d) The PT providers in the participant's own country, which probably will also have (summarised) information about the PT schemes of other providers; e) A search on the Internet, using relevant keywords, can also provide useful information.